(4) Figures to the right indicate full marks. 1(a) Which are the different methods of solving recurrences. Explain with examples. (10 marks) 1(b) Comapare Greedy and dynamic programming approach for algorithm Design. Explain How both can be used to solve Knapsack problem? 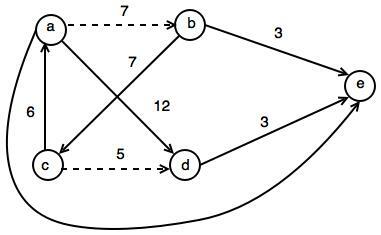 (10 marks) 2(a) Explain the analysis of quick sort and apply the same to sort following data [1 0 7 5 9 1 2 3](10 marks) 2(b) Write single source shortest path algorithm & apply the same for following. pat [ ]= MBA(10 marks) 3(b) Comapare Prims & Kruskal's method for finding Minimum spanning Tree find MST for following using prims method.